There aren’t many inherited diseases more concerning to Labrador lovers than exercise-induced collapse (EIC). This potentially fatal condition caused by a mutation in the DNM1 gene results in an inability to produce adequate amounts of a protein called dynamin 1, which plays an important role in nerve signal transmission in the body. As its name suggests, dogs affected with EIC typically present during periods of intense exercise, often before 2 years of age. During an episode of collapse, affected dogs will commonly develop an awkward, wobbly gait that progresses to severe weakness, dragging of the hind limbs, and collapse lasting for 5 to 10 minutes. Though unable to rise, dogs experiencing an episode of collapse are usually mentally alert and pain-free. Most dogs completely recover within 30 minutes and appear normal between episodes. Most concerning however, is that in some cases affected dogs can progress to a more severe state of collapse which can include disorientation, full body weakness, loss of consciousness, seizures, and even death. EIC is a recessive inherited condition, meaning that dogs must inherit two copies of the associated DNM1 gene mutation in order to develop clinical signs of disease (See “How Are These Diseases Inherited” section below). However, it has been reported that some dogs inheriting two copies of the mutation do not show clinical signs of EIC. Though some dogs may never show these signs simply because they are not subjected to a level of exercise strenuous enough to induce a collapse, it is also probable that there are other genetic or environmental factors which play a role in how this disease presents. Dogs inheriting two copies of the mutation that do not show clinical signs of EIC, can still have puppies which will eventually collapse with exercise. Therefore, it is not recommended to breed these dogs regardless of their medical history. Much more benign in its clinical outcome than EIC, hereditary nasal parakeratosis (HNPK), is another inherited disorder known to affect Labradors. Mostly a disease of esthetics, HNPK is typically first recognized in dogs 6 to 12 months of age due to the presence of unsightly thick, dry and rough, gray to brown crusts of excess keratin on the nose. On occasion, affected dogs may also develop deep, painful cracks or erosions in the surface of the nose that predispose them to secondary bacterial infections. Some affected dogs experience a loss of nose pigmentation and some reports describe development of excessive crusting on footpads or on the hairy portion of the nasal bridge. Clinical signs of this disease tend to wax and wane throughout the course of a dog’s life. Though there is no cure for HNPK, owners of affected dogs can improve the condition of the nose and prevent cracking through lifelong use of topical medications and emollients. Though more of a nuisance than a life-threatening condition, HNPK can prevent Labradors from showing well in the conformation ring and may predispose working Labradors (which are at greater risk of trauma to the nose) to have lifelong problems with cracking of the nose and subsequent bacterial infections. Both of the diseases discussed in this blog are inherited in a recessive fashion meaning that a dog must inherit two copies of the genetic mutation (one from each parent) in order to develop the disease. Dogs inheriting a single copy from one parent are considered carriers. Carrier dogs are not expected to show clinical signs of these diseases, but can produce affected puppies if bred with another carrier of the same mutation. 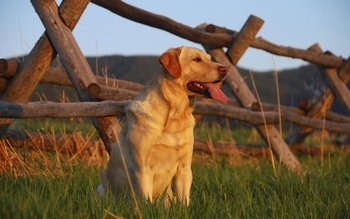 Genetic testing of Labradors can consistently identify carriers of the mutations responsible for these diseases, thus allowing for breeders to eliminate them from their blood lines through informed selective breeding practices. If you have additional questions about inherited diseases that could affect your dog or general inherited disease related questions, please contact Paw Print Genetics at AskUs@pawprintgenetics.com or call the Paw Print Genetics laboratory at 509-483-5950 (8 am to 5 pm PST; Monday through Friday).